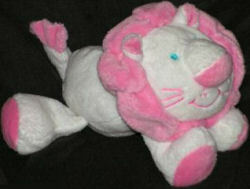 This appears to be the same lion in pink. She is looking for the BLUE ONE. My son has had Mr. Lion since he was 2 months old. 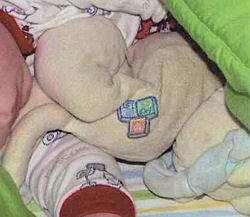 He received the stuffed animal in 2002 from a friend of mine- who cannot remember where she got it. He is now 5, and Mr. Lion is in really bad shape. He keeps asking me to go to the store and get another one. I have tried to explain to him that mommy cannot find another one. I have searched all over the internet and ebay with no luck. He did have a beige body and a blue mane. He had a rattle inside and little beads. I would say he was a velour type material. My Mother in law has since sewn him a wrap for his body- which you will see in the picture- because all of his stuffing is falling out from the various holes in his body. There was a tag on him that said something like My First or First with the letters ABC’s. One of our readers has added the information that the tag on his tush does NOT say ABC. The top block is a heart, left bottom block says “my”, and the bottom right block says “1st”. Another parent has added this information:My daughter has a pink cat with the same block patch on its bottom. The tag says, “2001 Commonwealth Toy & Novelty Co, Inc. New York, NY-Bunde, The Netherlands. I think it was bought in Macy’s, but I’m not sure. It would have been bought in Feb 2006. Hope this helps. Any help you can provide would be greatly appreciated. Thank you for taking the time to read my email. Could be …. and thanks for contacting the seller for me. i have the pink one here somewhere…. Mabye you can search their site and find it! Thanks for the tip about Kmart. I checked, though, and could not find it there. Thanks!! I sent off the link. Bless your heart Tami!!! Email sent, fingers crossed again!!! Know there was some discussion as to which was exact match. All appear to be very similar to each other.